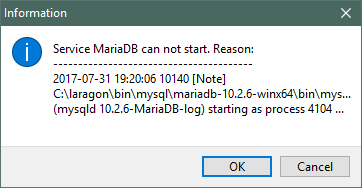 Since a few days ago laragon refuses to launch MariaDB. I updated it to 3.1.3 but the error persists. 10140 [Note] InnoDB: Highest supported file format is Barracuda. 10140 [Note] InnoDB: 128 out of 128 rollback segments are active. 10140 [Note] InnoDB: File '.\ibtmp1' size is now 12 MB. 10140 [Note] Plugin 'FEEDBACK' is disabled. 10140 [Note] Server socket created on IP: '::'. 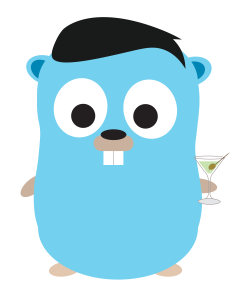 10140 [Warning] Neither --relay-log nor --relay-log-index were used; so replication may break when this MySQL server acts as a slave and has his hostname changed!! Please use '--log-basename=#' or '--relay-log=BLADERUNNER-relay-bin' to avoid this problem. 10140 [Note] Added new Master_info '2017-07-28 19:39:49 2132 [Note] C:\laragon\bin\mysql\mariadb-10.2.6-winx64\bin\mysqld: ready for connections. The log is very cryptic to me and I can't figure out what's wrong. Any help? @CØRE : The error log is very strange. Can you rename data to data.bak so Laragon will create a new fresh datadir for you? @leokhoa That fixed it. It seems that laragon loaded MariaDB but was trying to access data/mysql/ instead of data/mariadb/.